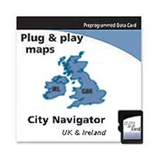 MicroSD memory card, City Navigator NT, UK & Ireland. Detailed map coverage for Great Britain and Republic of Ireland containing full coverage of Great Britian, Isle of Man and the Channel Islands. Full coverage also included for major cites in Northern Ireland including motorways, national and regional thoroughfares and local roads. Contains navigational features such as turn restrictions and speed categories. Points of interest such as: food and drink, lodging, border crossings, petrol stations, hospitals and more. Now with expanded points of interest and full postal code support in the UK.